THE GOG BLOG by RORY SPEARS, Editor and Director of Content. Follow Rory on Facebook, Linkedin and Twitter @GogBlogGuy with Elisa Gaudet President of the Ex. 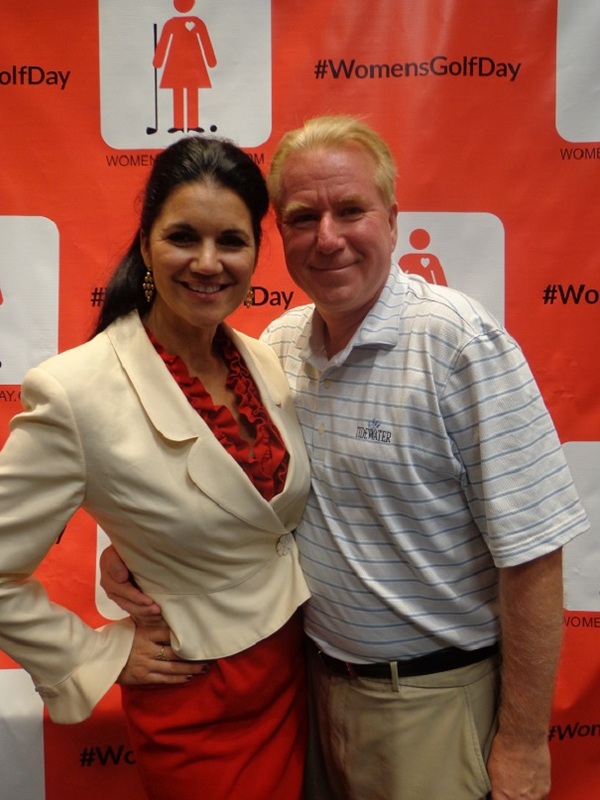 Golf International and Women’s Golf Day. June 6th, 2017, mark it down on your calendar right now. It’s Women’s Golf Day, it runs four hours and it is bringing more ladies out to the golf course. It started last year with over 430 golf courses in over 20 countries and movement is growing. Enter Elisa Gaudet the President of Executive Golf International, and author of three golf books called Two Good Rounds written in three different styles. 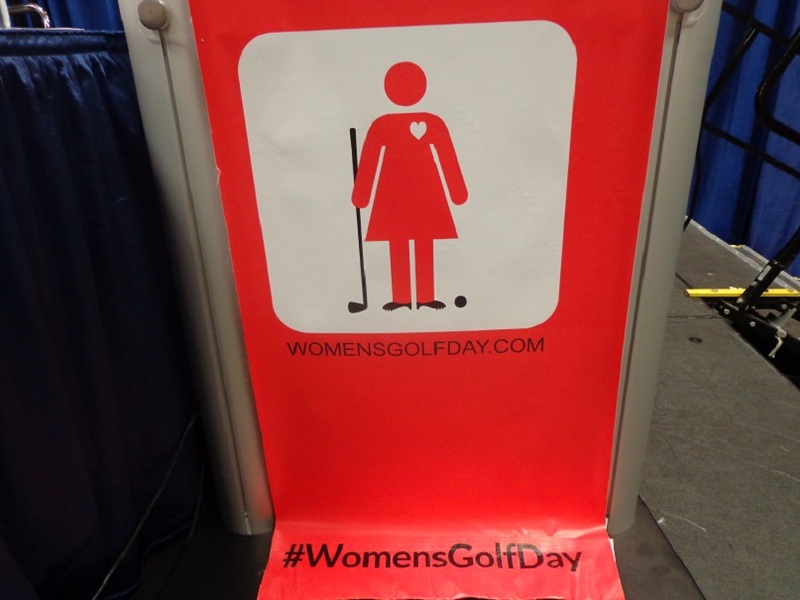 Gaudet (Gaw-day) elected to start a women’s movement in an area they could be proud of, golf. While the first tee shot was a good one, and the first round was even better, there is still more that can be done as the movement heads into the second round. 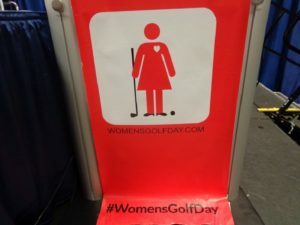 For the golf courses that are supporting Women’s Golf Day, or if your golf course would like to join this national movement to bring ladies to the golf course, it doesn’t take a lot of time or energy to put it together. Women’s Golf Day on June 6th is simply this, it’s a four hour event, the first two hours women’s can play nine holes of golf, or take lessons and hit golf balls on the practice range. Hours three and four are about being social and sharing your golf experience with other women who just enjoyed a golf experience at a golf course or golf club. Click here to hear out interview with Elisa Gaudet on Women’s Golf Day 2017. Gaudet says the video on the website showing last years events is moving, and so were the countless emails she received about how much this day, and playing golf going forward has helped so many women. For more information about June 6th and Women’s Golf Day, please visit Womensgolfday.com and don’t forget to pick up a copy of Two Good Rounds, all three editions. THE GOG BLOG by Rory Spears, Editor and Director of Content. 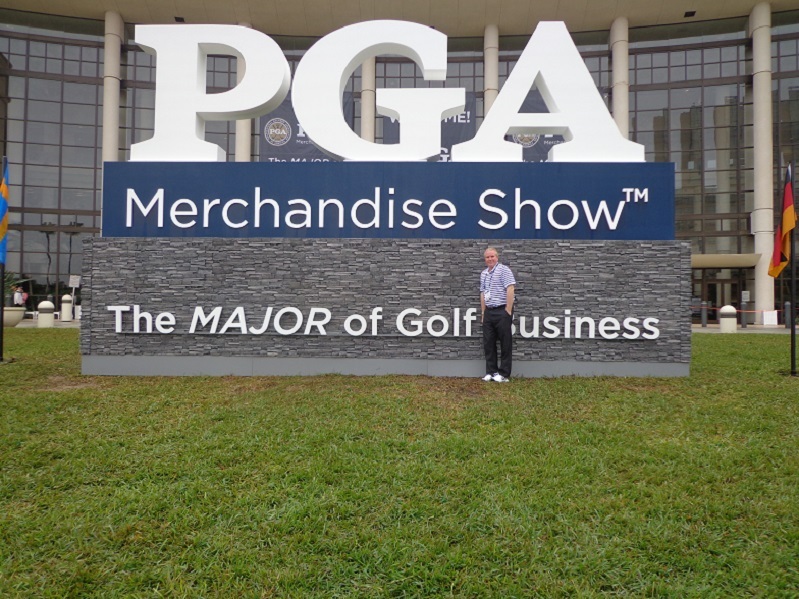 Follow Rory at the 2017 PGA Show and on Facebook, Linkedn and Twitter @GogBlogGuy. 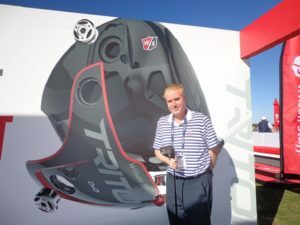 With the new Wilson Triton Driver- winner of the Driver vs Driver contest. It all started some years back in Michigan when then Major Dan Rooney wanted to do more for his fellow military veterans. Rooney was not only a fighter pilot in the military, he was a PGA Section golf professional in the state of Michigan. What started out the first year as a golf outing that raised a little more than six thousand dollars, has now grown into an organization called the Folds of Honor that raised over 7 million dollars last year. Folds of Honor Sr. VP of Public Relations Maj. Ed Pulido works the booth at the 2017 PGA Merchandise Show. That money helps out military families with scholarships to colleges, and more. That money comes from the tireless efforts of people like USA Major Ed Pulido, who was injured in combat in the Middle East. Pulido who was honored by both generals and two U.S. Presidents, is coast-to-coast constantly raising funds for the FOH. This year like in past years the Folds of Honor held a special event at the PGA Show, announce the contributions and the money raised. Click here to hear our interview with Folds of Honor Major Ed Pulido from the PGA Show. Folds of Honor raises many of it’s dollars from National Patriot Golf Day over Labor Day weekend, mark it on your calendar, and visit Foldsofhonor.org for more information. 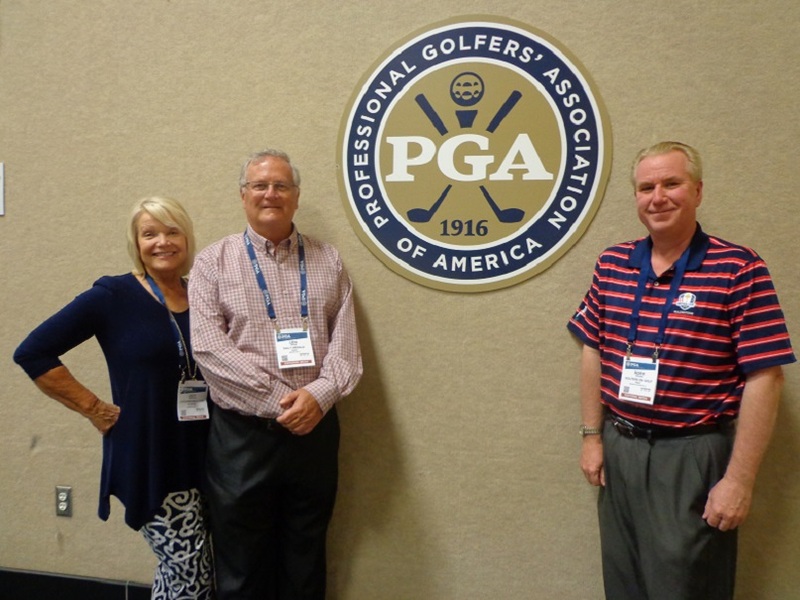 A BIG 3, Joy Sarver and Len Ziehm of Len Ziehm on Golf, and Rory Spears, Editor and Director of Content. Follow Rory on Facebook, Linkedin and Twitter @GogBlogGuy. The PGA Merchandise Show is one place to get golf on the mind for the year ahead. The show itself has products from many companies you have heard of, and some new ones that you have not. 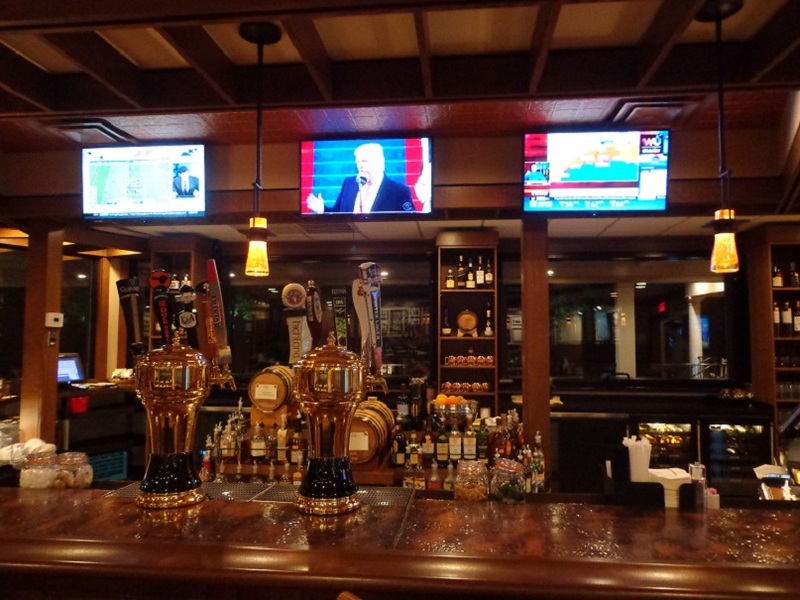 It’s a place for everyone to introduce what’s new, and what’s old but now improved. As the years go by and things change in our society, they change in golf as well. Players are finding new ways to enjoy the sport we love. The keep score in a new way, or don’t keep score at all, they wear different shoes and apparel. They have lightweight golf bags and head covers with everything from animals to logo’s of the wolrds greatest golf courses on them. All in all this show is where you see it all. Back by popular demand is the Ziehm and Spears podcast, that tells the story of the show and what two veteran observers have seen this year, below are our thoughts summed up in 11 quick minutes and change. 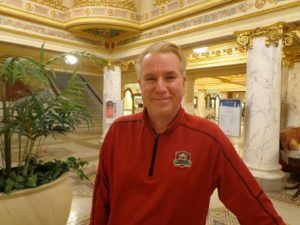 Click here to hear the Len Ziehm and Rory Spears podcast recapof the 2017 PGA Merchandise Show. Please also follow the PGA Show on Lenziehmongolf.com. THE GOG BLOG by Rory Spears,. Editor and Director of Content. Follow Rory to the PGA Show and on Facebook, Linkedin and Twitter @GogBlogGuy At the Wilson Golf booth with the new Driver vs Driver Winner, Triton. IF THERE is ever really a day that launches golf for the year ahead, it’s demo day at the PGA Merchandise Show. 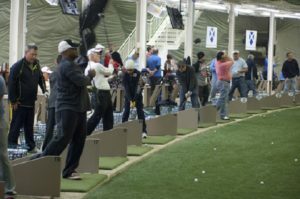 It gets many of the nations golf pro’s out hitting balls on a driving range. trying out a new club that might go in their bag, but more likely to go in their pro shop and then in your bag before it goes out on the golf course. The next three days the show moves indoors to the Orange County Convention Center in Orlando Florida. It’s quite a show as trade shows go, for those of you in Chicago imagine McCormick Place loaded end-to-end with golf products and golf apparel. It really is something to see, The Golf Channel will have a special on it in the next day or two. 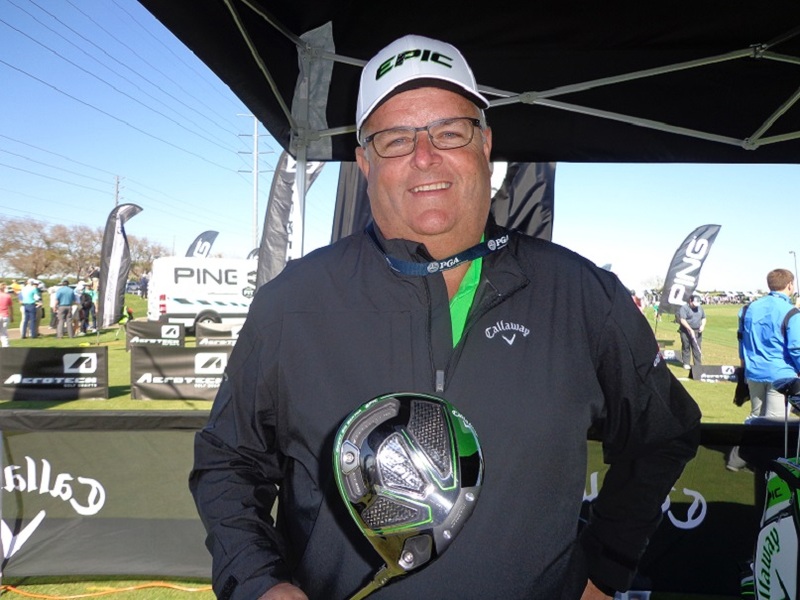 Paul Schlimm of Callaway Golf show’s off the new Epic Driver, part of the Great Big Bertha Family. One of the highlights of demo day usually revolves around new drivers and this year was no different. First on the tee was Wilson’s Driver vs Driver winner the Triton, that now according to Wilson Golf GM Tim Clark is now totally conforming thanks to the USGA. 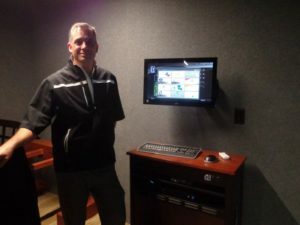 Triton if you didn’t know is now back on the shelves in your golf show and retail stores like the PGA Tour store. I’ll speak more with contest winner Eric Sillies and Clark in the next two days, and find out more about what’s next for Sillies and Wilson Golf. Could Iron vs Iron be next. I did hit the Triton and it feels a little funny when you first line it up, but after a few swings it settles right into your comfort zone. I had mixed results with an 9.0 loft that Clark had me hit. But for fun Maryville academy professional Juan Espejo had me hit a 12.0 loft and with todays wind, it really sailed all three times I hit it. Clark showed me the small changes the USGA had Wilson make to make Triton conforming, you really have to wonder what the USGA was thinking. I’d like to ask them again, but I’m sure the same answer would come my way, that the testing process is confidential. CALLAWAY GOLF has introduced a new driver called EPIC. 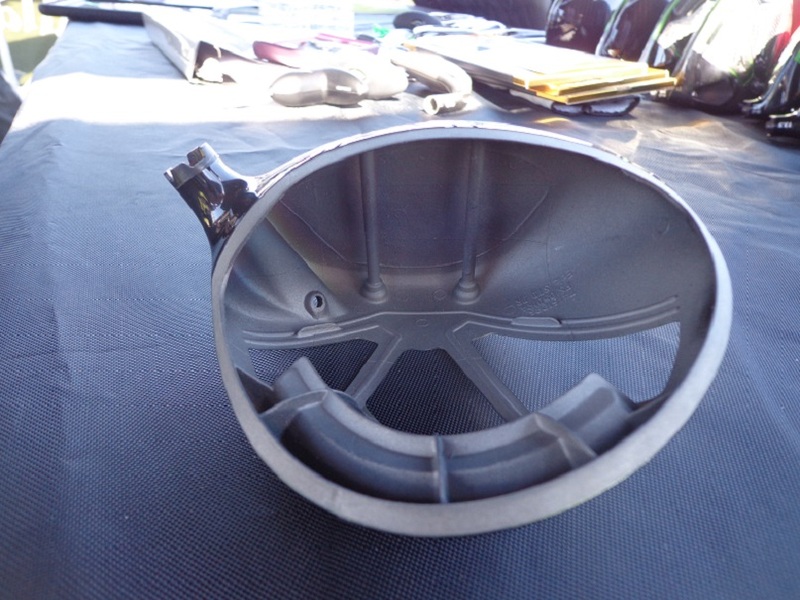 It’s part of the Great Big Bertha family, it has a novel inside that you don’t always see. It’s also part of the reason that the club is not very easy to build. I did not hit the Epic but I will back in Chicago in the weeks ahead. Callaway Golf has some good things going on with putters. First off with the Odyssey putter line and then with the purchase of the Sean Toulon Putter Company. I’ll have more on Callaway as well over the next few days. If you watch the golf industry and companies that are the major players in club making, you have to be impressed with the direction of Wilson and Callaway. 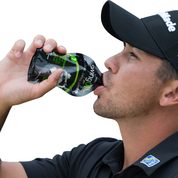 Both companies are generating a lot of real golf product buzz. TAYLOR MADE GOLF which has been for sale for a while now, might have a group ready to buy them, which is news in itself, but what is adding some fuel to the fire here is that Tiger Woods might be part of the group. I’m sure the folks at Bridgestone will be thrilled if there is any truth to this rumor, not sure if there is any more news on this subject coming out while the show is still on. This is not real golf product buzz. TITLEIST GOLF announced some new additons to the Scotty Cameron Putter line, with the Futura and Newport lines. But while the Titleist hitting area was busy with demo day patrons hitting the new 917 line, what seemed to be an even more active area of Titleist was the short game zone loaded with Bob Vokey wedges. THE FOLDS OF HONOR held it’s annual show party last night at the convention center, it’s always great to hear the tribute stories from family members of our military veterans who have been helped by the foundation. The convention side of the show starts shortly, I’m headed to the floor to find out who is headed to the course and the tee box, and what else is good golf news. Stay clicked in. THE GOG BLOG by RORY SPEARS, Editor and Director of Content. Follow Rory to The Pit Golf Course, and on Facebook, Linkedin and Twitter @GogBlogGuy. (Writing from Pinehurst, NC) by Rory Spears. I couldn’t do an interview with Pinehurst Resort President Tom Pashley, without bringing up a subject that had some steam back around the 2014 U.S Open at Pinehurst, but had dropped off the map since. 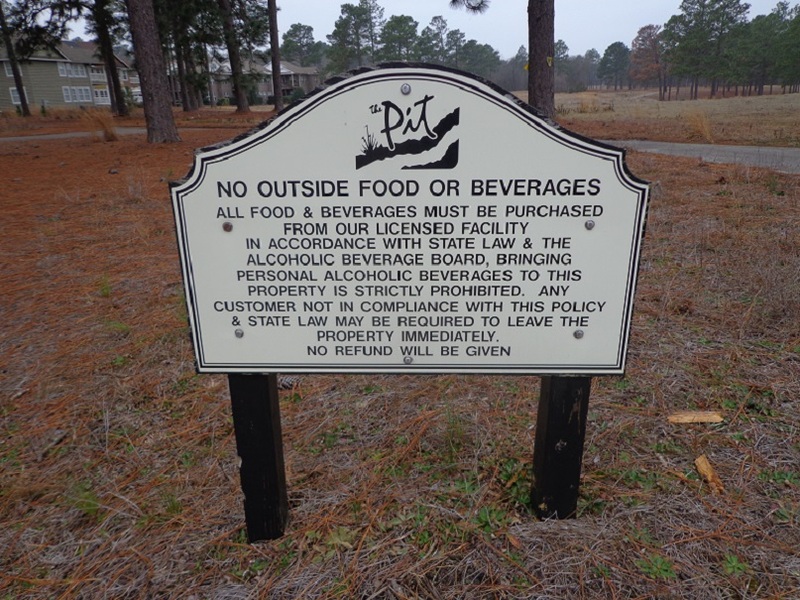 What about the golf course formerly known as “The Pit” just off the edge of the Pinehurst Resort property. The Pit built and opened back in 1985 by architect Dan Maples, was one of those courses that golfers had a love or hate relationship with, so say the locals or the stories on line. 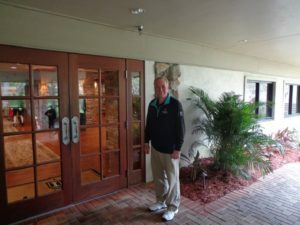 But when it closed and was sold back in late 2010, after the course fell victim to the financial climate of the times, it wasn’t hard to find golfers wishing the course was still open. 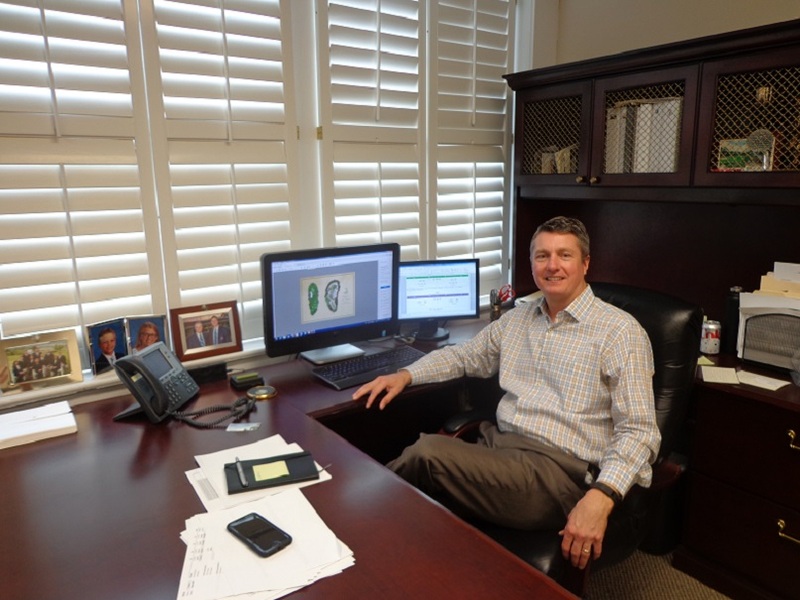 Pinehurst Resort President Tom Pashley in his office that overlooks the 18th green of Pinehurst #2. Since it closed the course the course has apparently been sold, twice. Once to a local businessman, and then to the Pinehurst Resort. The Pit property according to Pashley was about 300 acres, that land now sits side-by-side with 700 acres that the resort previously owned. 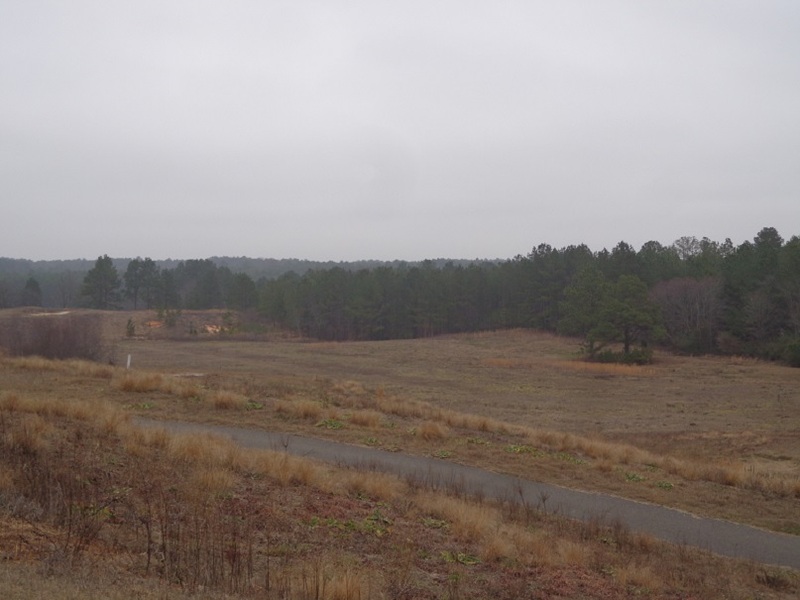 During the interview with Pashley, he admits that that if any new course was built on the land, the architects could have up to 1,000 acres to work with. The Pit’s clubhouse front entrance is now overgrown. It’s also unlikely that the name “The Pit” would last as part of the Pinehurst Resort. Even though the resort does have this “thing” for preserving history. If a new course opens on the land, it would likely be called Pinehurst #10. The Pit at Pinehurst #10 ? Just asking. When the resort didn’t have any pictures on file. I decided to go exploring around the abandoned golf course and see what I could find on the property, that claimed it’s original name from mining work that had previously been done on the site. This area from left of the clubhouse was reportedly the short par 4, 10th hole. I walked out in several directions from the clubhouse to follow the routing a few holes in each direction. It was an easy walk for the most part, since the cart paths are still in pretty good shape. I found evidence of golf being played on the site, and old Titleist was laying in what was the 11th fairway. On a hole that appears to be late on the front nine, the water stand, was still standing. I was curious to see what Bill Coore and Ben Crenshaw are seeing as they walk the land. Yes, Ben and Bill have submitted a routing that runs through the 1,000 acres the resort has to build on. 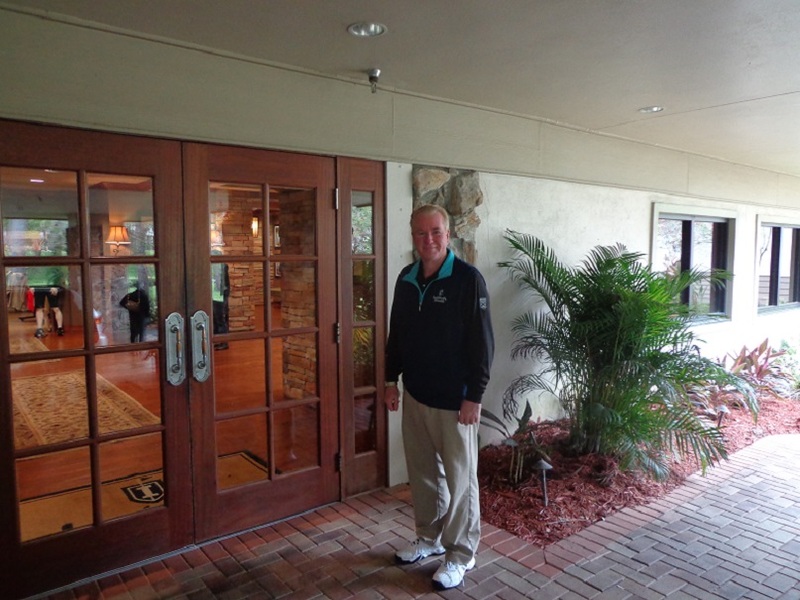 Pinehurst Owner and CEO Bob Dedman has been spending his fair share of time out on the property, walking it as well. Signs of the Pit still exist just outside the clubhouse. Based on the current routing that Crenshaw and Coore have turned in to the resort, if that plan stands, not much of the old Pit would come into play as part of a Pinehurst #10 course. Pashley admits that only 3 or 4 holes from the old routing would be back in play. If that’s true, then there will be plenty of tall pine trees to clear out. 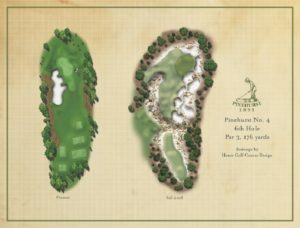 So if this new Pinehurst course happens, when does it come online. 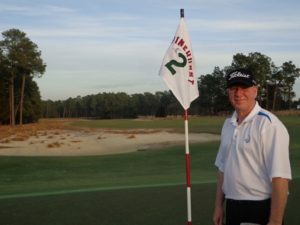 Click here to hear our interview with Tom Pashley regarding the future of the Pit, and could it become Pinehurst #10. Pinehurst has quite a project going with course #4 and other things attached to that overall project. So it’s probable that at some point after #4 reopens in late 2018, that Pinehurst will catch it’s breath and then take another look at creating Pinehurst #10. In 2019 the U.S. Amateur will be played at Pinehurst, it wouldn’t come as a surprise if the resort announces the project either right before or during the championship, when the golf media assemble. I can tell you this, with the land the resort has there from the old Pit property and the additional 700 acres they have previously owned, the potential for Crenshaw and Coore to create another “something special” golf course on that site is there. For more on Pinehurst see Pinehurst.com. or call (800)- ITS-GOLF. The Gog Blog by Rory Spears, Editor and Director of Content. 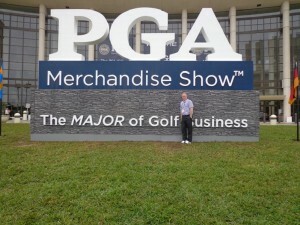 Follow Rory to the PGA Merchandise Show in Orlando, and on Facebook, Linkedin and Twitter @GogBlogGuy. IT’S THAT TIME OF THE YEAR, for most people in the golf industry to really launch the 2017 golf season. 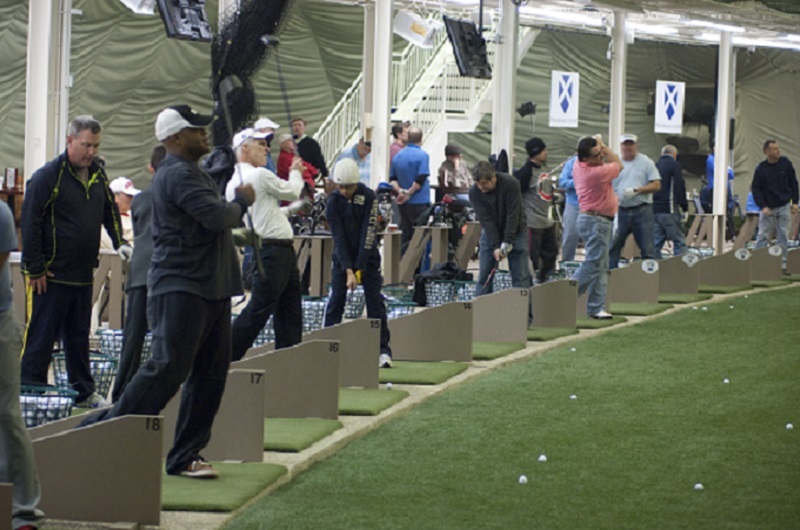 Over 40,000 people will attend the four-day show, with one day at the Orange County Driving Range for demo day, and then three days in the convention center. Where attendee’s will see just about every product on the golf market today and maybe some that are hoping to be very soon. BIG 3 Partner Len Ziehm and I will be in Orlando, with Tim Cronin back in Chicago minding the fort on the local front. Ziehm and will check in with our podcast reports during the show on multiple days. 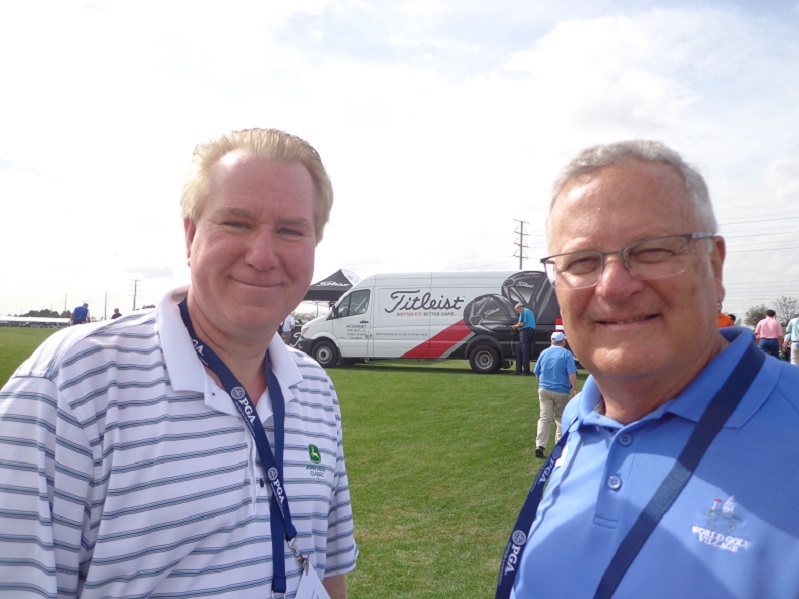 Rory Spears with Len Ziehm at demo day during the 2016 PGA Merchandise Show. I know that Len and I have already received about a 100 emails each with everything going on at the show. We will spend Monday night at the new Ziehm Florida estate planning our show coverage strategy. What I do know is there will be plenty of things to see, and both this website and Lenziehmongolf.com will have plenty of material to write about in the weeks ahead. So stay clicked in with all the partners for all the latest updates. At some point during the show, The Golf Channel will air a one-hour TV special, watch local listings for times and dates. In Dueces the new bar behind the 18th green at the Pinehurst Resort and Country Club, with Pinehurst Presdient Tom Pashley. Pinehurst has hit a Home Run with creation of Dueces. See Pinehurst.com for details. After starting the winter trip at the French Lick Resort, home of the new 2017 Sr. LPGA Championship this July, I continued on to Pinehurst where it’s always a beautiful day. 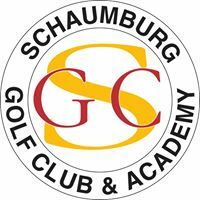 It’s been a great place to open the 2017 golf season with three rounds and 54 holes of golf. Starting the year on Pinehurst #2 was asking a bit much from my golf game after 2 months off, but I’ll take the seven pars I made and try to improve the rest of the year. Since then I moved over to Southern Pines, and have enjoyed two days of play and stay at Talamore and the Mid-South Club. Both are very good and should be on golfers hit lists. 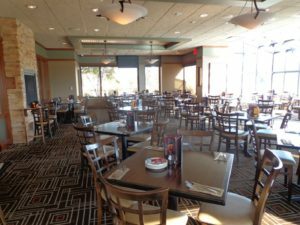 The lodge at the Mid-South Club is about as good as it gets for golf stays. I’ll have more on both clubs in the next couple of days. 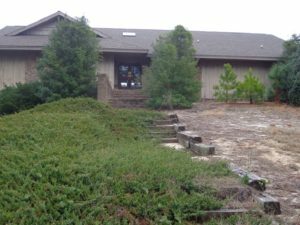 The front entrance to the clubhouse at The Pit is overgrown, but it might see life again. 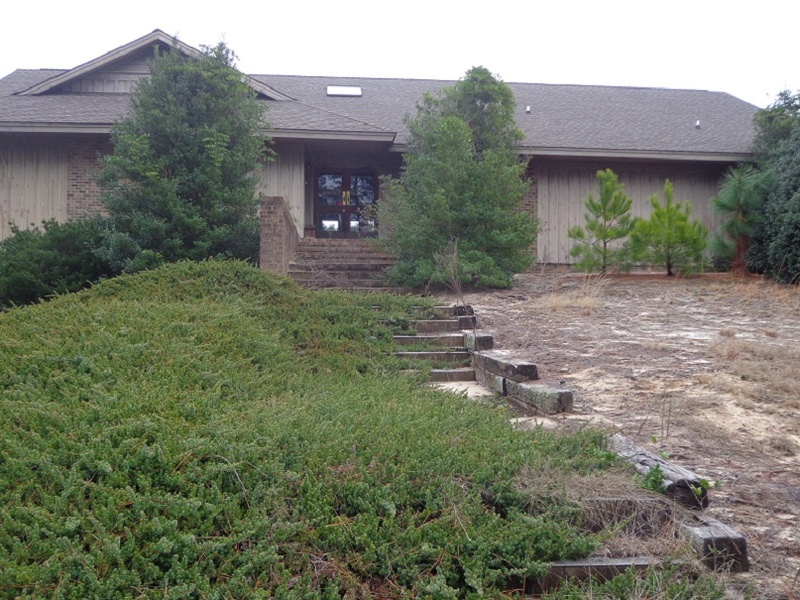 This Dan Maples design could live again according to Pinehurst Resort President Tom Pashley. The Pit was orginally opened in 1985, but closed about 25 years later and was sold, and then sold again to the Pinehurst Resort. More often than not, The Pit is referred to as a golf course that many golfers who played it, wish was still open. Could it happen again, maybe so. Probably not as The Pit, but maybe as Pinehurst #10. 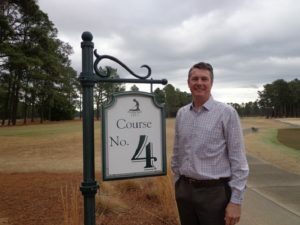 Tomorrow hear our interview with Pashley as he talks about The Pit, and the fact that Ben Crenshaw-Bill Coore and quite often Pinehurst Owner and CEO Bob Dedman have been out there walking the property. Stay clicked in to hear about my visit to The Pit, as I walked several of the old holes this past weekend. The last few days since being on the road has really got me fired up for the show and the golf season ahead, I hope as you hit the domes, watch the pro’s on TV, or watch the golf show special later this week, you too will start getting excited about golf season. With that it’s off to Florida and some even warmer weather. Stay clicked in. RS. THE GOG BLOG by RORY SPEARS, Editor and Director of Content. Follow the Gog Blog and Rory on Facebook, Linkedin and Twitter @GogBlogGuy. In Dueces at Pinehurst, with Resort President Tom Pashley. 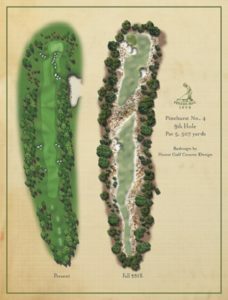 With the success of Pinehurst #2, that now includes bold looking waste area’s, more yardage and a rotation of par between holes 4 and 5, Pinehurst Resort is now announcing a change to it’s # 4 course. Architect Gil Hanse the designer of the olympic course, and lead architect on several other Top 100 courses, gets the nod for the restoration of this Donald Ross original design. Upon the completion of the course 4 work, the course will have more of a course #2 look and feel to it. The rendering of the 6th hole on Pinehurst #4, before and after. Hanse’s work will not stop with just a course #4 restoration, Hanse will create a nine-hole short course of par 3 holes, that will range from about 60 yards to just over 100 yards. The course will have greens that will allow Pinehurst members and resort guests to get creative, and practice different shots around the green, before they head out and play courses 1-9. This course will be done on just 10 acres. In order to create the short course there will be some restoration work on courses #1 and #3. These adjustments on courses 1 & 3 will help return the courses to the original visions of Donald Ross. The before and after restoration look for hole #9 on course 4. The work will begin this October and is expected to be completed with the course reopened for play in the fall of 2018. 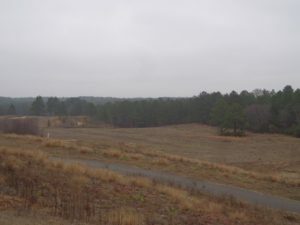 In addition to the work on courses 1, 3 and 4, the overall plan also calls for work to be done on Maniac Hill, Pinehursts driving range, the first range in America. The resorts putting course Thistle Dhu, will be moved closer to the clubhouse and expanded. 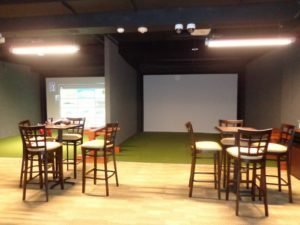 Allowing for more golfers to come and enjoy this experience. (For additional comments on this project from Pinehurst President Tom Pashley see our previous story). Pinehurst President Tom Pashley stands near the first tee of course #4, that will undergo a Gil Hanse restoration. THE GOG BLOG by Rory Spears, Editor and Director of Content. 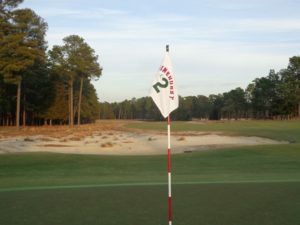 Follow Rory to Deuce’s behind the 18th on Pinehurst #2, and to Facebook, Linkedin and Twitter @GogBlogGuy. 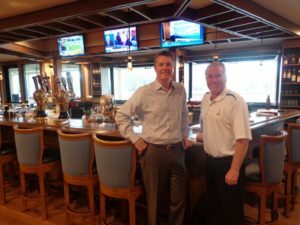 With Pinehurst Resort President Tom Pashley. On January 20th it was time for a new president, #45 to take office. Here in Pinehurst North Carolina another president sits at his desk over looking #2. Course #2 that is, yes that course #2, the one that will host four U.S. Opens in 25 years. 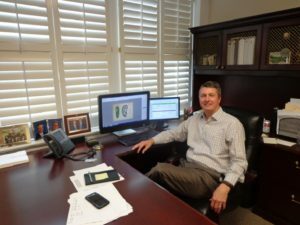 Holding the reigns these days at the birthplace of american golf, the Pinehurst Resort is Resort President Tom Pashley. The job of president at Pinehurst sounds like a job that everyone who loves golf would like to have. While there is some truth in that, it’s that kind of responsibility that goes with the job that keeps Pashley a busy man. The bar in Deuces, the new center of attention at the Pinehurst Resort, that has chairs looking out on to one of the most historic 18th hole’s in golf. Since taking over as president Pashley has seen the boom in business because of the renovated Pinehurst #2, by Ben Crenshaw and Bill Coore. But Pinehursts projects didn’t stop there. As Pashley is quick to explain, that while Pinehurst looks to continue it’s great history and traditions, there is that responsiblity of getting modern, so that today’s younger families and generation still find Pinehurst a great destination. Next step for Pinehurst is a major project in the renovation of Course #4. This Donald Ross original was last renovated by Tom Fazio in the late 90’s, this time it’s Gil Hanse who will get the call. It was not the easiest of decisions to make in bringing in Hanse, even though it was easy when you look at Hanse’s track record. The tough part fell into the lap of Pashley who drove to Fazio’s office in Henderson North Carolina to inform Fazio of the decision. One that Pashley was glad that Fazio took quite well. 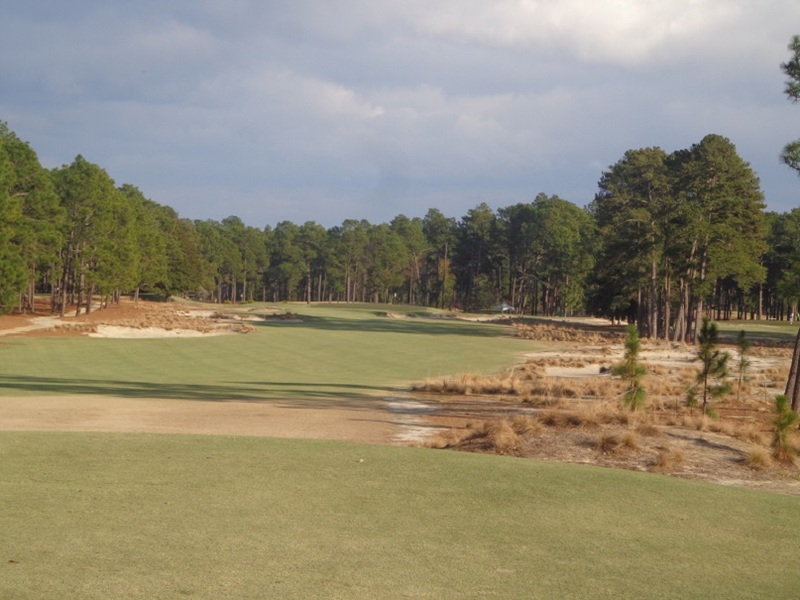 The restoration of Pinehurst #2 has changed the way golfers think about the course, how they play the course, and they vote which Pinehurst course in their favorite. Well Pashley and Pinehurst got it right, there are some nice touches around the new bar, including a new location for Putter Boy, the original Donald Ross drawing of Pinehurst 2 underglass (complete with a mustard stain on it). The windows can all open giving Dueces that open air feel and look right onto the action as players try to hole out their putt, or recreate the famed Payne Stewart winning putt from the 1999 U.S. Open. The Par 4, 14th hole on Pinehurst #2. The course #4 restoration also brings a few other other changes with it, like the addition of a nine-hole par 3 course. To get land for the addition of the par 3 course, there are changes made being to adjoining courses # 3 and #5. The putting course Thistle Dhu, will get relocated as well. Off the course work has led to the addition of a brand new pool, room renovations last year in the historic Carolina Hotel. 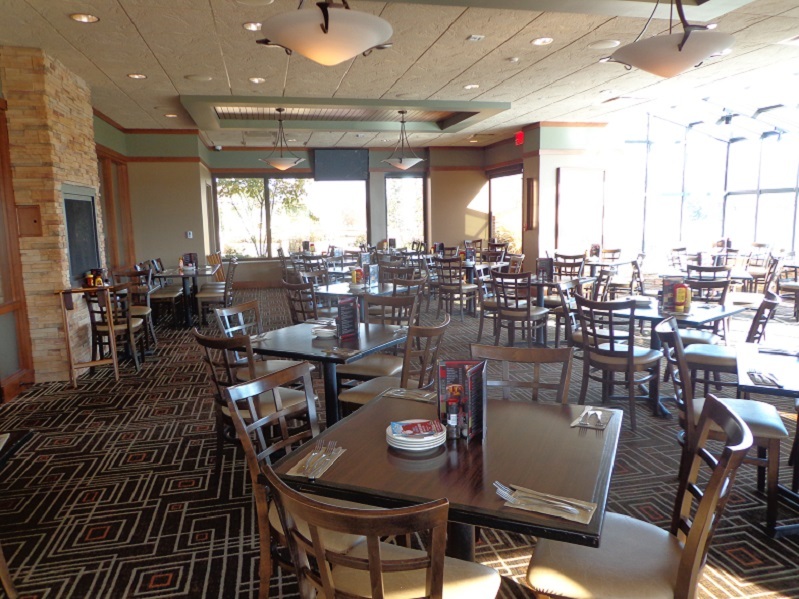 Underway right now, are room and dining renovations in the Holly Inn, and that will not be all. Click here to hear our interview with Pinehurst resort President Tom Pashley. It covers a wide range of topics and looks at what the resort is doing to keep improving as a resort destination. PINEHURST #10, yes that is a strong possibility, if it happens this course will not be “A Pit”. 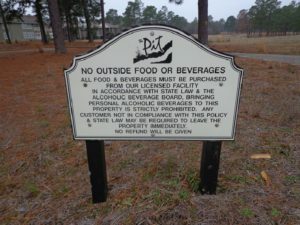 More on a potential Pinehurst Course # 10, coming in Part 3 of our look at The Pinehurst Resort & Country Club. DID YOU KNOW ? that Pinehurst is more than resort. It’s real name is Pinehurst Resort and Country Club, a club that has over 4,500 members, even though all of them are not golfers. Even with nine courses, Pinehurst would have trouble finding 4,500 tee times if all the members wanted to play the same day. Golf memberships are very affordable and members do receive quite a few benefits. If you would be interested in membership, please inquire. Part 2, will be our look at the Pinehurst Course #4 renovations. For more information on Pinehurst the host of the 2017 USGA Foreball Championships, the 2019 USGA Amateur Championship and the 2024 U.S. Open, please visit Pinehurst.com or call (800)-ITS-GOLF.